U.S. #740 pictures El Capitan, a 7,564-foot high granite peak. 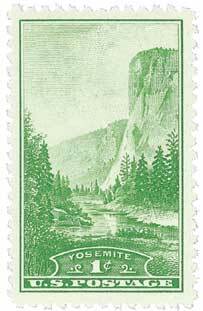 On June 30, 1864, President Abraham Lincoln signed the Yosemite Land Grant, which made Yosemite Valley the first piece of land set aside by the U.S. government for preservation and public use. The first humans to visit the Yosemite area arrived about 10,000 years ago, and it was first settled around 3,000 years ago. By 1200 A.D., the area’s main inhabitants were the Sierra Miwoks, though other Miwok, Monos, and Shoshone tribes visited often to trade. 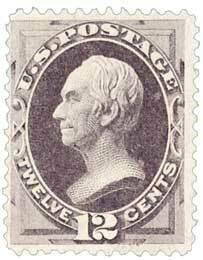 U.S. #151 – From the National Banknote Printing of 1870. Esteemed statesman Henry Clay died on June 29, 1852, after nearly 50 years in politics. Henry Clay was born on April 12, 1777, in Hanover County, Virginia. The seventh of nine children, Clay began working as a secretary at the Virginia Court of Chancery at a young age. From there he went on to work for the attorney general, where he developed an interest in and began studying the law. He was admitted to the bar in 1797. Bosnia & Herzegovina #B13-15 commemorates the third anniversary of Ferdinand’s assassination. 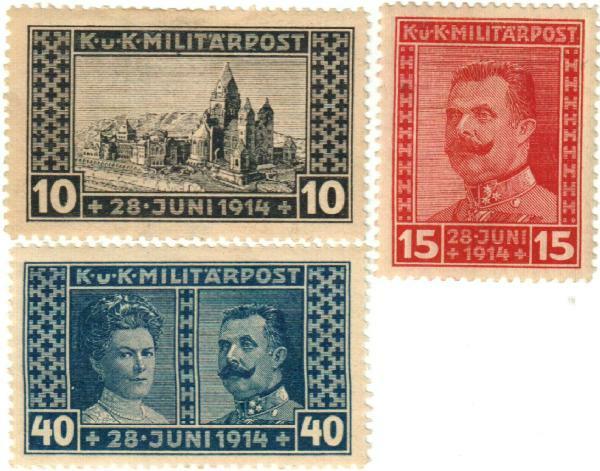 On June 28, 1914, Austrian Archduke Franz Ferdinand and his wife were assassinated by a Bosnia Serb nationalist, sparking World War I.
Europe was experiencing a rebirth of nationalism and imperialism in the early 1900s, along with mounting military power in many countries that was needed to protect their interests. Several powerful nations built alliances promising mutual aid against outside threats. Unrest among civilian populations, often teetering on the brink of revolution, added to the explosive mix. 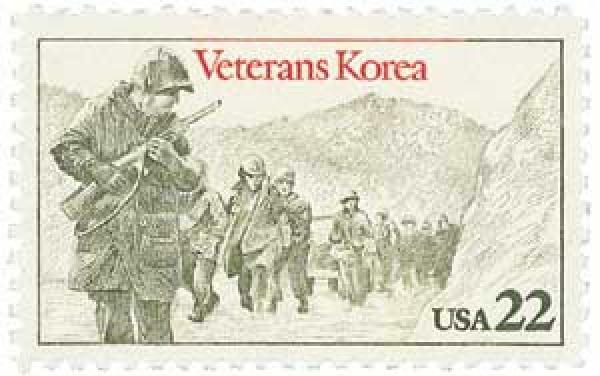 On June 27, 1950, President Harry Truman announced that America would send troops to aid South Korea. As World War II came to an end, the Allied leaders discussed the fate of the Japanese Empire. Korea had been an imperial colony since 1910 and was one of the areas under consideration. At a meeting in Cairo in 1943, it was decided the U.S. would occupy the southern part of the Korean peninsula, and the Soviet Union would rule the north. Two young U.S. colonels chose the latitude line 38 degrees north of the equator as the dividing line. The occupation was supposed to be temporary, and the ultimate goal was for Korea to be “free and independent in due course,” according to the Cairo conference. 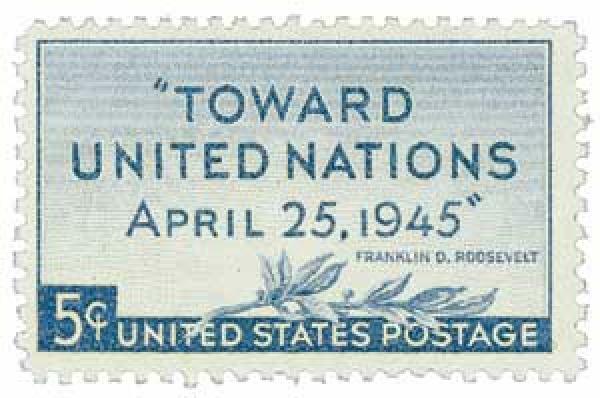 U.S. #928 was the last stamp created under FDR’s leadership, issued just two weeks after his death. On June 26, 1945, 50 nations signed the United Nations Charter. Following the Paris Peace Conference that ended World War I, several nations joined together to create the League of Nations, aimed at maintaining world peace. However, the league was unable to prevent the aggression of the Axis powers in the 1930s that ultimately led to World War II. U.S. #2345 pictures the historic capitol building in Williamsburg. 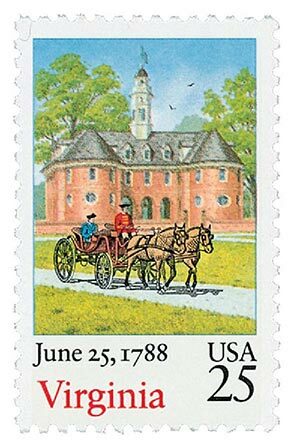 On June 25, 1788, Virginia ratified the U.S. Constitution and was admitted as the 10th state of the Union. Several Indian tribes lived in Virginia when the first European explorers arrived. These included the Powhatan, Monacan and Manahoac, Nahyssan, Occaneechi, Susquehanna, Cherokee, and Nottoway. Spanish Jesuits created a settlement on the York River in 1570, but Indians destroyed it after just a few months.